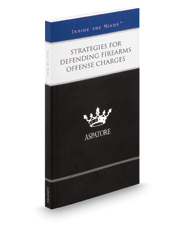 Strategies for Defending Firearms Offense Charges provides an authoritative, insider's perspective on best practices for interpreting new and existing laws that govern firearms offenses and navigating clients through these complex cases. Partners from some of the nation's leading law firms guide the reader through the civil litigation process for recovering one's rights to possess firearms and explore proposed legislation that seeks to restrict rights in response to recent tragic events. From examining the historical development of major state and federal laws to closely scrutinizing recent Second Amendment litigation, these experts identify key techniques that may assist in defending firearms charges. Additionally, these authors take a glimpse into the future of gun laws and where defense attorneys may focus their practice by identifying the strong countervailing trends where discussion of gun ownership has become a popular topic in the mainstream media. The different niches represented and the breadth of perspectives presented enable readers to get inside some of the great legal minds of today, as these experienced lawyers offer up their thoughts on the keys to success within this complex field.